Historically Service 417 has was operated by Birmingham and Midland Motor Omnibus Company Limited (BMMO—Midland “Red” Motor Services) between Worcester, Cradley, Bosbury and Ledbury, with certain journeys extended to or from Hereford before the 1960s. In modern times the service still runs, mostly over the same route, but today it is subsidised by Local Authorities and has therefore been operated by a number of different companies. I have not been able to establish exactly when BMMO first introduced bus services between Worcester and Ledbury, but by c. 1922 there were BMMO services running between Worcester and Cradley as Service 126 on Mondays and Saturdays, and between Ledbury and Bosbury from Tuesday 11th May 1920 as Service 91A on Tuesdays for Ledbury Market Day. By 1924, Service 126 between Worcester and Cradley had been extended to Ledbury on Wednesdays only, which is Market Day in Hereford. The August 1924 timetable for this route stated “On Wednesdays these ’Buses connect with ’Buses to and from Hereford.” However, the only service running between Hereford and Ledbury during this period was Service 91, and there were no connecting journeys shown. Unless there were additional journeys not shown in the timetable, this statement must have been an error. From the formation of the company, the system of route numbering used by BMMO was quite chaotic with any new route introduced simply being allocated the next available number in sequence, irrespective of the type of route or the area in which it operated. To simplify matters a numbering system divided into geographical groups was introduced on Saturday 16th May 1925. At the time of writing, I have not been able to establish what new route numbers were allocated to Service 126 between Worcester and Ledbury, and Service 91 between Hereford and Ledbury, but it is believed these remained two separate routes until about 1928. On Saturday 11th February 1928, Birmingham and Midland Motor Omnibus Company Limited (BMMO—Midland “Red” Motor Services) renumbered their entire network and at this time the Worcester, Ledbury, and Hereford route was renumbered to Service 417. Service 417 route ran between Worcester and Storridge via Rushwick, Bransford and Leigh Sinton much the same as the buses on the 417 route run today, but then ran via Stiffords Bridge, Prestons Cross and Finchers Corner between Storridge and Bosbury, with the Cradley Village only being served on Saturdays. Certain journeys diverted at Finchers Corner to run to Mathon (Coddington Turn), returning to Finchers Corner over the same route. Timetables from the late 1920s and early 1930s were quite complex, with each day of the week having a different, unique set of running times. Buses on Thursdays did not run between Ledbury and Worcester at all, probably because this was half-day closing in Ledbury, while certain journeys on Tuesdays, which is Market Day in Ledbury, ran as Service 473 via Colwall and Ham Green. 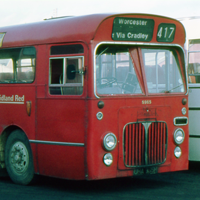 On Wednesdays certain journeys ran as Service 410 via Ashperton, and on Saturdays additional short-working journeys ran between Worcester and Cradley Village as Service 417, and between Worcester, Cradley and Mathon Village ran as Service 418. By 1935, the Service 410 variation via Ashperton had been withdrawn. The Service 473 Market Day variation had been cut back to run only between Ledbury, Colwall and Mathon Village, while additional Service 418 journeys were added on Tuesdays, extended to Ledbury via Colwall, to give extra journeys on that section of the route. The Service 418 variation was withdrawn during the Second World War and after the War was later replaced by additional Service 473 journeys between Ledbury and Mathon Village only. On Thursday 1st July 1937, BMMO acquired the operations of H.F. Taylor and with it a service that ran between Ridgeway Cross, Finchers Corner, Prestons Cross, Stiffords Bridge, Leigh Sinton and Belmont. BMMO operated this route as Service 376 until Friday 27th May 1938, when it was withdrawn and replaced with additional journeys on Service 417, which were timed to connect at Leigh Sinton with Service 377 (Worcester–Leigh Sinton–Malvern) to provide a through service to Malvern. Service 377 was withdrawn on the outbreak of the Second World War and was not replace after the war finished, as the post-war Service 377 ran over a different route and did not serve Leigh Sinton. By the 1950s, many Service 417 journeys ran between Hereford and Ledbury only, or between Worcester and Mathon only, with only a very small number of peak time journeys running the whole route between Worcester and Hereford. These journeys were very generously timed and crews would often comment that it would be quicker to walk. Buses working the whole route were required to turn round in Ledbury at the Market House, and then would typically be parked up for a while as the crews took advantage of the generous running time and visited a local cafe for a cup of tea, safe in the knowledge that they could recover any late time on the next leg of the journey. From the early 1950s a small number of short-working Market Day journeys ran between Cradley and Ledbury only on Tuesdays, these journeys were operated by Malvern depot, and were withdrawn in 1972 as part of wider cuts to rural services. By 1960, Service 417 had been shortened to run only between Worcester and Ledbury, and the Ledbury to Hereford section was replaced by extra journeys on Service 477 which ran between Great Malvern, Ledbury, and Hereford. This change was probably introduced because of the introduction of one-man operations at Hereford depot in 1956. Splitting the route at Ledbury would ensure that all journeys between Hereford and Ledbury could be operated solely by Hereford depot, and thus be completely converted to one-man operations. 1 During the 1940s and 1950s, very few journeys ran the whole route between Worcester and Hereford. Many journeys ran either between Worcester and Prestons Cross (or by the mid-1950s, Mathon) only, or between Ledbury and Hereford only. 2 Only certain journeys ran to Mathon, other journeys ran direct between Finchers Corner and Bosbury. On Saturday 11th March 1978, Midland Red Omnibus Company Limited introduced the “Wandaward” MAP area scheme in the Hereford area. At this time the timetable was just as chaotic as before, with only Monday and Friday running the same schedule. The Cradley to Ledbury section of the route was withdrawn on Saturdays and only ran with one or two journeys on weekdays. Service 418 was introduced as a variation running via Coddington Turn on Tuesdays only, for Ledbury Market Day, partly replacing the Service 419. The timetable issued at the “Wandaward” MAP launch stated that ”these services are at present under review”, and soon after, possibly with the “Severnlink” MAP scheme, the Cradley to Ledbury section was withdrawn on all days. Midland Red Omnibus Company Limited ceased trading as a bus and coach operator at the end of services on Saturday 5th September 1981, and Service 417 passed to the newly formed Midland Red (West) Limited from the following day. 1 Only certain journeys ran to Mathon, other journeys ran direct between Finchers Corner and Bosbury.